Saint Austin's Pub: Blind Bather? Who cares about the Hagelian Dialectic,predestination and existentialism. What I care about is the seeing-eye dog's animal rights. No dog should be made to suffer through bath after bath after bath. Everyone knows that dogs don't like bathing. That's why they roll in the dirt afterwards! 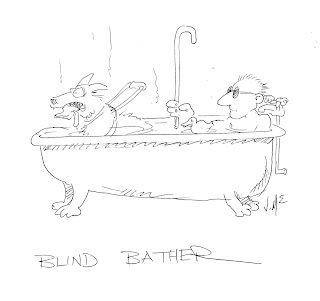 There really ought to be a law against blind bathing and the distress it causes these poor loyal animals. And another thing, don't you think that for blind bathers to drive their own trucks is preferable to exploiting and oppressing another species? After millenia of forcing noble beasts to serve human masters do you not think it is time that we return the favor and bestow on lesser beings the same rights and services we ourselves have enjoyed? Thank you Mr. Zzyzx for raising this important issue and making us aware of the plight of seeing-eye dogs the world over. You're right. It finally dawned on me that it must have been the seeing-eye dog who was driving the truck! And I bet the dog wasn't even getting paid. Surely congress is considering a minimum wage bill for dogs. I just hope my taxes get raised on account of this bill. That may help alleviate some of the guilt I feel for being a human oppressor. I mean an oppressive human. No, strike that. I'm an animal oppressor because I'm human and I feel very, very bad about it. That's right. In that case then, I think it would be only fair for you to provide full health care benefits for these dogs, as well. That's a great idea. Do you think dental and optical are necessary though? Well, maybe optical. They are seeing-EYE dogs after all. Oh yes - definitely vision care! I hope you weren't being sarcastic. How insensitive would that be to have a Seeing-Eye dog who can't see well. Besides, they need to be able to pass the driving exam. That reminds me of something I read in the Bible about the blind leading the blind, but that will bring us back around to theology. Do you think there's a theology behind the use of guide dogs? I wonder if seeing-eye dogs have anything to do with Balaam's donkey. The donkey certainly saw more than Balaam did. Hmm. An Estonian man who was caught driving a car even though he is blind has been at it again, police said on Monday, and this time he faces jail. Police first arrested the man, 20, a week ago. "We arrested the same blind man driving his car again on Saturday in the town of Torvandi, near Tartu (in southern Estonia)," said Marge Kohtla, a spokeswoman for Tartu police district. "He was drunk. There were three people in the car with him giving him instructions." She said police wanted the court to jail the man for 30 days and confiscate his car. I thought you made that up but I found it on Yahoo Odd News. Perhaps instead of confiscating his car the court should appoint him a seeing-eye dog to drive for him. It only seems fair to me.